Hospital acquired infections (HAI), also known as “healthcare-associated infections” or “nosocomial” infections, are infections that patients get while undergoing medical treatment in healthcare facilities. They are infections that are not present and without evidence of incubation at the time the patient is admitted to a healthcare facility. Most infections that become clinically evident after 48 hours of a patient’s hospitalization are considered hospital acquired. These infections occur in all types of medical facilities, including hospitals, outpatient surgical and care centers, and long-term care facilities, such as nursing homes and rehabilitation centers. For example, consider the case of a patient who is admitted to the hospital to undergo orthopedic surgery, such as a hip or knee replacement. The surgery is successful from an orthopedic standpoint. However, while recovering in the hospital, the patient develops a life-threatening Staph infection. Or, consider the case of a patient who undergoes successful surgery to remove a benign growth from her body, only to develop an infection caused by a contaminated surgical instrument. In both cases, the surgeries were considered a success, but the outcomes were dramatically and negatively impacted by the hospital acquired infections. In its February 22, 2012 broadcast, the Today show on NBC featured a story entitled TODAY Investigates: Dirty surgical instruments a problem in the OR, reporting on other, real-life victims of hospital acquired infections. Hospital acquired infections are among the leading causes of preventable deaths in the United States.1 HAIs cause more deaths in the U.S. each year than automobile accidents, fires and drownings combined. Such infections lead to extended hospital stays and result in substantially increased medical costs. The U.S. Centers for Disease Control and Prevention (CDC) published a study in 2009 which concluded that the medical costs to the U.S. of hospital acquired infections ranges from $28 billion to $34 billion annually.2 Considering the extraordinary costs of HAIs to the public and the government, one would hope that a greater emphasis would be placed on preventing such infections. • Acinetobacter species, and • Enterobacter aerogenes. The pathogenic organisms capable of causing infections can survive for prolonged periods on hospital surfaces and medical equipment. The hands and gloves of nurses and other healthcare providers can acquire these pathogens upon contact with contaminated hospital surfaces. 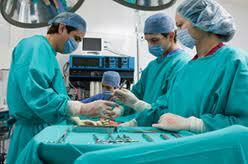 They can then transfer these organisms to patients they touch subsequently and to other surfaces in the hospital. Accordingly, there needs to be a greater emphasis on the importance of properly cleaning and disinfecting hospital surfaces and medical equipment. Unfortunately, this important component of infection prevention does not get as much attention as other components, such as hand washing. What good is a sterile operating room environment if one of the instruments to be used during surgery is contaminated? For many years, healthcare facilities have characterized nosocomial infections as “known risks” or “unavoidable complications” of lifesaving care. Dr. Barry M. Farr, one of the leading infection-control experts in the United States, takes issue with these misleading characterizations of preventable infections. “The number of people needlessly killed by hospital infections is unbelievable, but the public doesn’t know anything about it,” said Dr. Farr. “For years, we’ve just been quietly bundling the bodies of patients off to the morgue while infection rates get higher and higher.”5 While various efforts are underway to implement and improve infection prevention programs, Georgia hospitals and surgical centers can and must do a better job of preventing healthcare-associated infections. 1. Klevens, RM, Edwards JR, Richards, CL Jr., et al. “Estimating Health Care-Associated Infections in U.S. Hospitals, 2002. Public Health Rep. 2007 Mar-Apr; 122(2):160-6. 2. Scott, R.D. II. The Direct Medical Costs of Healthcare-Associated Infections in U.S. Hospitals and the Benefits of Prevention. U.S. Centers for Disease Control and Prevention. March 2009. 3. Berrens, M. “Tribune Investigation: Unhealthy Hospitals.” Chicago Tribune July 21, 2002. 4. Pollack, Andrew. “Rising Threat of Infections Unfazed by Antibiotics.” New York Times February 26, 2010. 5. Berrens, M. “Tribune Investigation: Unhealthy Hospitals.” Chicago Tribune July 21, 2002.